Great time to make this English classic. I like to kick mine up a notch or two.. this time I added cilantro and chives. Everyone loves fish and chips in my family.. I usually make it when we are all home for dinner at the same time- like a Sunday! 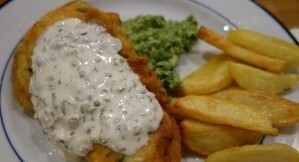 I made the fish and chips as well as delicious tatar sauce and the mushy peas. Marinate the fish fillets in the garlic and salt. Keep aside for an hour. Create a breading station. Add ½ cup flour to a small platter, add some salt, mix and keep aside. Add the beaten eggs and some salt to another platter and mix and keep aside. Transfer the 1 cup flour, baking powder, 1 teaspoon salt, cayenne pepper, cilantro and chives to a medium bowl. Mix well and slowly add the club soda while whisking the batter until completely smooth. Keep aside in the refrigerator until ready to fry. Add the oil to a wide frying pan and heat on medium heat. In the meantime, take each fish fillet, dredge it in flour, dip it in the egg mixture and then dip it generously in the batter and make sure all parts are coated well. Immerse into the hot oil and repeat with the rest of the fillets. Cook on medium heat, about 3 to 4 minutes on each side or till fish is cooked through but not over done. Place on a paper towel lined platter to drain excess oil. 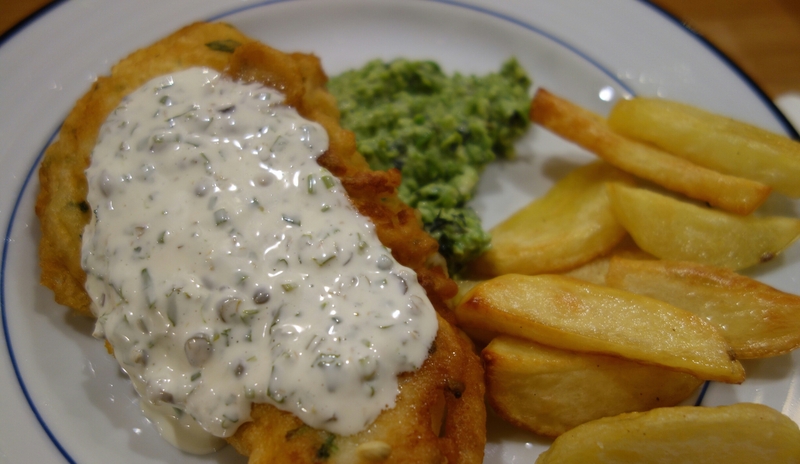 Serve with fries and tartar sauce. Transfer the potatoes to a saucepan and fill with water. Bring to a boil and simmer for 5 minutes. Drain the potatoes and let them dry in the same pan for about 10 minutes. Transfer the potatoes to a lined cookie sheet. Sprinkle the salt and drizzle the olive oil. Mix well and bake in a hot oven for about 20 to 30 minutes or till golden brown. Serve warm with fish. Mix all the ingredients in a small bowl, mix well and serve with fish. Blanch the asparagus in boiling water for a minute and shock them in ice water to retain the color. Keep aside. In a wide frying pan, heat the pancetta on medium heat. Cook for 8 to 10 minutes on medium heat. Transfer to a paper towel lined plate. Add the onion into the pancetta fat and sauté on medium heat for 3 to 4 minutes. Add the all purpose flour and stir for about 30 seconds. Add the chicken broth and cream and whisk till the liquid is smooth. Bring to a boil and simmer till thickened and reduced by one third- about 5 minutes. Add the lemon juice, tarragon. Add the peas and asparagus and warm them through. Add salt to taste and garnish with the crispy pancetta. Mushy Peas- Served with the Fish and Chips! Here is the fabulous mushy pea recipe..
Add the peas to a small saucepan with a cup of water. Add the garlic and bring to a boil. Cook for 4 to 5 minutes and drain saving the garlic clove. Add the cooked peas and garlic to a processor and add the mint, chives, lemon zest, lemon juice and salt. Process it till mushy but not completely smooth. Take out of the processor and check for seasonings. Add the crème fraiche. 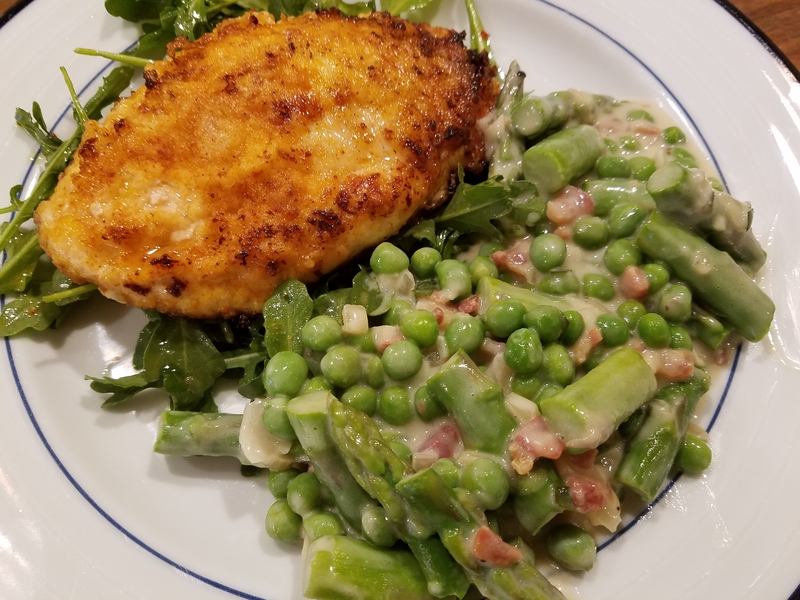 Serve with fish and the chips.